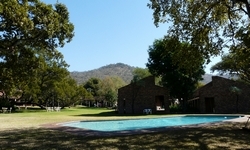 Nestled deep within the scenic Magaliesberg region one can find The Venue Country Hotel which is a stunning retreat from the concrete jungle. Surrounded by majestic rolling hills and lush greenery found only in the Magalies' area, the hotel is truly a unique experience for stay over guests, day-time visitors and conference delegates alike. The Venue Country Hotel offers guests and clients multi-purpose venues for multi-level conferencing, seminars and product launches - just to name a few. Each venue is unique and can be transformed into the perfect location for your event. The hotel has four breakaway rooms, 3 conference rooms and a large auditorium. Each venue has audio and visual facilities as well as access to wireless internet.